Never before in Malaysian history have so many people had so much to spend on their homes, and this is causing an explosion of projects in the luxury residential development sector. At the core of this phenomenon are the demographics of the buyers. Aged between 46 and 62 (meaning they are born between 1946 and 1962), they have lots of money - more than any previous generation - and are willing to pay for properties that fit their lifestyles. Instability in the stock market, along with escalating real estate values, low interest rates and a desire to own homes with resort-style themes are boosting the popularity of luxury residences in such settings. Being used to affluence, this group of buyers are willing to go where their lifestyle pursuits can be met at levels beyond their expectations. This explains the warm reception that has been given to E&O Property Development's (E&OPD) latest signature houses in its Seri Tanjung Pinang (STP) project in Penang island. One-of-its-kind designs The developer has conceptualised limited-edition and one-of-its-kind units and experiences to set them apart from anything else the market has to offer. On one of the last pieces of prime real estate in STP's 240-acre phase one, E&OPD together with Al Salam Bank (of Bahrain) and CIMBMapletree Real Estate Fund 1 Sdn Bhd (a private real estate fund managed by CIMBMapletree Management Sdn Bhd), took a giant leap to create exquisite seafront villas. The 15-acre freehold site commanding a 750m frontage onto the Straits of Malacca will accommodate 40 "Villas-by-the-Sea", as they are called, ranging from RM2.63 million to RM7.1 million. Although the idea behind their designs revolves around maximising the views of the pristine Andaman Sea, the feeling of warm sea breezes and the sound of waves lapping on the shores through the use of large window openings, high ceilings, and broad verandahs, each villa will be of different sizes and have unique features to suit various lifestyles. The Skye By-The-Sea design, for example, will have a unique suspended walkway leading to a sunroom on the topmost level, spacious double-volume spaces in the breakfast and family areas, and an open dry kitchen with a central island that will be visible from the more formal dining area. In all, 20 units of these three-storey villas sitting on plots with typical dimensions of 50ft by 100ft and with between 5,193sq ft and 5,283sq ft of built-up space are available for between RM2.63 million and RM3.1 million. 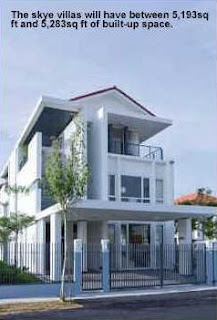 At the same price range, there is also the larger Abrezza By-The-Sea villa. With 5,332sq ft of built up space, the six-plus-one bedrooms in its three levels will include a sizeable guest room/office complete with an attached bath on the ground level as well as a master bedroom with a private study nook. Other highlights will be an outdoor patio straddling a water feature and several balconies on the upper floors. At the top of the designer range will be Martinique By-The-Sea. Described by E&OPD as "an extremely luxurious mansion, inspired by the grand plantation manors of the Caribbean and the sea", only four will be built. Each will have private sea frontages to provide unobstructed views of the ocean, widths of approximately 80ft and lot sizes of between 11,275sq ft and 12,860 sq ft. Spread over two levels, the highlight of the 9,043sq ft "grand villas" has to be the tension-edged private lap pool that, from the dining area, appears to reach out to join the sea's horizon. The pool will be flanked by a large high-ceiling guest pavilion on one side and a guest suite complete with an en-suite bathroom and walk-in wardrobe on the other. In the open-concept designer kitchen that will open out to a spacious internal courtyard and across onto the dining area (which will also have ocean views as its backdrop), there will be a huge central island, fitted kitchen cabinets, a refrigerator, cooker hob-and-hood, oven, microwave, water dispenser and dish washer. On the upper level will be a family hall and four bedrooms. Of these, three will look out to the sea, while the Arabescarto-marble master bedroom will also have a "secret garden". Of the four Martinique villas, two have already found owners while the completed display villa is not for sale, despite the price tag ranging from RM6.65 to RM7.1 million.